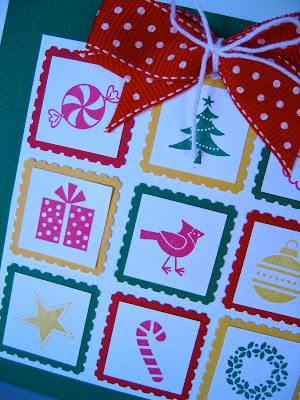 Ann Craig - distINKtive STAMPING designs - Stampin' Up!® Australia: Christmas Bingo. Stampin' Up! has so many fabulous paper craft products and accessories that make creating a breeze. Card stock, papers, ribbons etc are all colour coordinated with the inks and it really does take the guess work out of creating. 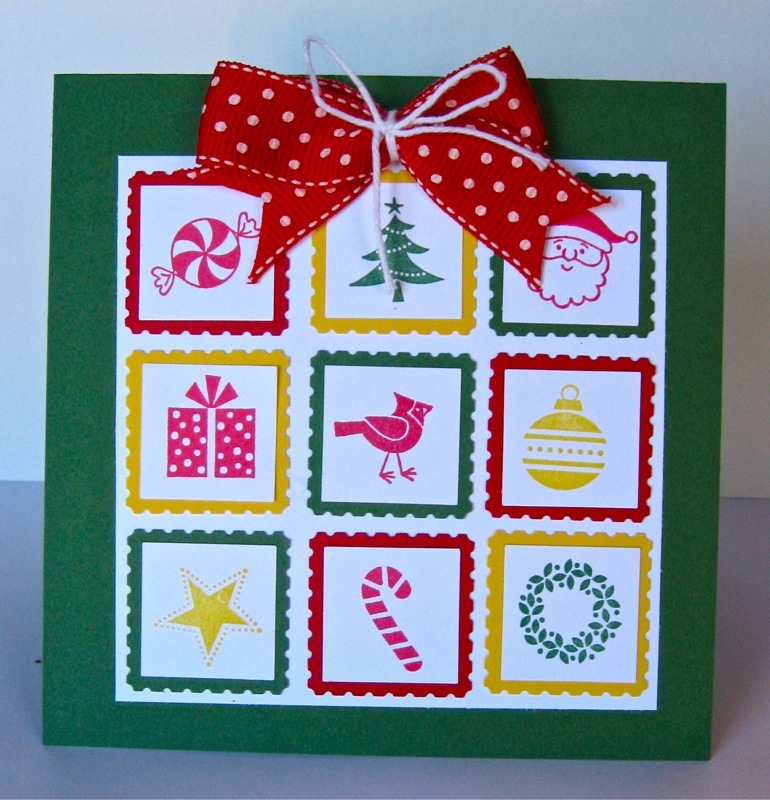 Here's a sweet card that could have hundreds of colour combinations. I chose to stick to some traditional Christmas colours and I really like the "fresh" results. 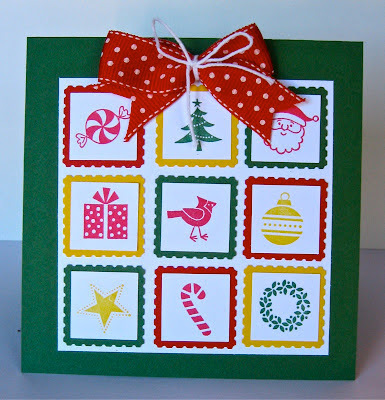 JOLLY BINGO BITS ( page 21 of the Stampin' Up! Idea Book and Catalogue) is a great set of 24 stamps making it extremely versatile for all your Christmas stamping needs. Today I've made a card that represents a Christmas gift. Each image is stamped onto Whisper White card and punched out with the 1 inch square punch, then matted onto shapes cut with the POSTAGE STAMP PUNCH. These 2 punches are "made for each other" and combine to give you perfect matting. 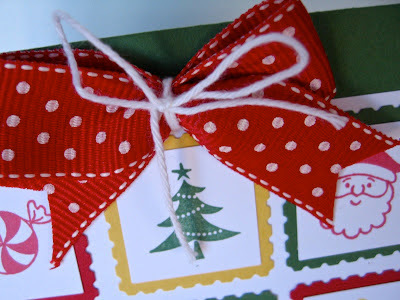 The bow at the top is not actually tied as a bow and this helps to keep the spotted side of the ribbon to the front. The WHITE BAKERS TWINE (available as a carry over item from the Summer Mini catalogue) is so soft, easy to work with and keeps the bow shape just where I want it. The bow is attached to the card using a small piece of STICKY STRIP. I've used just 9 of the 24 images available so you could make lots of varied cards. They are also great to use on tags and because they are one-colour stamping, they are quick and effective. If you would like further information on this project or would like to order the stamp set, punches and accessories, please contact me via my Demonstrator Business Website. Orders will be posted directly to you (Australia wide) or delivered if you live in the Canberra region.